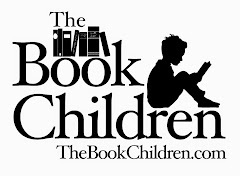 Being away for a week allowed me to do more than learn more about waldorf education and felt for a whole week. I was able to knit quite a bit during my free period, curled up in a sunny window. It was cold up there! 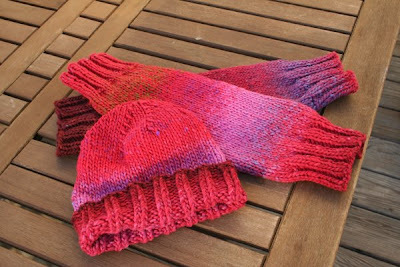 First I finished these legwarmers and hat for Elizabeth, made from Rowan Colourscape Chunky. They turned out really cute, and she loves them. We're debating a pom pom for the top of the hat. 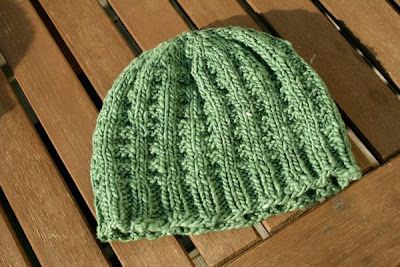 Next I knitted Paulie this waffle weave hat in a fabulous green merino from Linda at Natural Suburbia. It came out on the small-ish side for my taste, but the yarn is thick and warm. I also made this hat for Paul to match the scarf (both are for Christmas so shhhhh...) It came out a bit large (isn't that the way it always works?! ), but he likes his hats a bit roomy. The yarn is a wonderfully soft merino, also from Linda at Natural Suburbia. 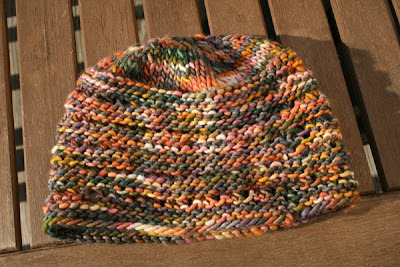 Then I used the Punta Merisoft Hand-Painted merino to make Soulemama's My Hat of Choice as I had planned. Another one a bit small. Urgh...what is going on?! I might have enough of this yarn left to make another hat so we'll see. I still love, love, love this yarn though. My WIP is another Soulemama's My Hat of Choice hat for a friend. 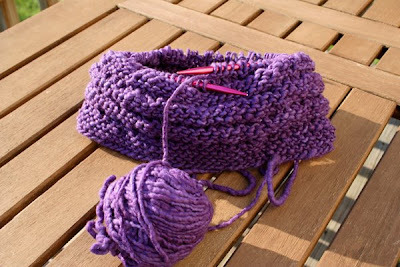 I'm using a slightly thicker yarn with 6 extra stitches in there. I like hats to cover the ears so I'm hoping this won't end up too big, just a little bit bigger than the last one. The yarn is a plum-colored merino similar to the green above, from Linda's lovely selection as well. Wow, beautifully knitted. You have been very busy and creative. You've inspired me to get more knitting done. Your work is all gorgeous, such pretty colors of yarn too. Wow, so beautiful! Now, when are you opening an Etsy shop???!!! Hope the little man is feeling better soon. Wow, Joy, your hats are all beautiful, I love the Soule Mama pattern, I also found it came out a little small so I have decided to add an extra pattern repeat, I now knit 6 pattern repeats instead of 5 and it fits much better. I have just knitted a navy one for Caiden and I am adding ear flaps. Funny! 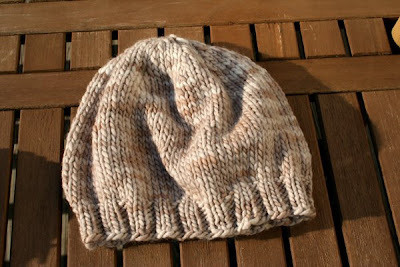 I just today knit up one of this hat pattern. I found it incredibly small; it fits my 7 year old; it was intended for me. But, I'm always happy if it just fits someone - if not, I'm happy to put it into the charity hat pile! Your knitting is all lovely.